I am very glad I didn’t say anything especially glowing about the Orlando Magic back on November 2, when they were “good,” before they remembered that they cannot truly be good, for they are the Orlando Magic. They almost fooled me! Back on November 2, the Magic were 6-2, with wins over the Heat, the Cavaliers, the Spurs, and the Grizzlies. They ranked 2nd in offensive rating, and 7th in defensive rating, and Aaron Gordon was lighting it up from everywhere on the floor, and D.J. Augustin was doing that thing he does every other year where he convinces you he’s actually a pretty decent NBA player. Nikola Vucevic was suddenly banging home threes. Evan Fournier was the most efficient scorer in the whole damn world. Jonathon Simmons looked like a budding star. You can see how some of this might’ve been, hmm, unsustainable? Aaron Gordon is a great athlete and a solid defender, but he is not ever ever ever going to shoot 57 percent from beyond the arc on any kind of reasonable volume over any kind of significant stretch of games again in his career. The Magic, saddled with Elfrid Payton and Bismack Biyombo and Jonathan Isaac, and a return to earth for Gordon and Augustin and Fournier, were not going to post a top-10 offense for long. Eventually they were going to settle somewhere south of what they’d done to fuel that promising start—the question, then, was how much they might slide. They are in the slide now, and it’s starting to look like it’s going to take them a long way down. Since their win over the Grizzlies on November 1, the Magic are 2-9. Fournier and Gordon have cooled off significantly. Augustin has missed a handful of games due to injury, and the return to health of Elfrid Payton has not made up the difference. Their offense has slipped from 2nd to 14th, and their defense has slid from 7th to 21st. They are currently mired in a seven-game losing streak after Friday night’s not-very-competitive loss to the Celtics. It’s been a reasonably tough stretch of opponents, featuring the Celtics twice, the Nuggets, the Warriors, the Trail Blazers, the Pacers, and the Timberwolves. But they also have losses to the Nets and Bulls on their résumé, and the Bulls, in particular, are pure garbage. And the bad news is, the Magic probably still have a ways to fall. Aaron Gordon is still in the part of his career where you’d expect incremental improvement each year, but his True Shooting this season (62.0 percent) is currently eight points higher than his previous career high, a gargantuan leap, the difference between a player of sub-average efficiency to one of the most efficient swingmen in basketball. From November 2 forward it’s a more reasonable 58.8 percent—still a very good number, one that is both more realistic than his year-to-date production, and also, itself, probably unsustainably high. Fournier is also currently riding career-high efficiency (59.9 True Shooting) on career high usage, but that’s not a formula that usually sticks—normally, when a non-superstar’s usage rises, his efficiency falls. Since November 2, Fournier’s usage has been 24 percent—higher than he’s averaged in any season in his career—while his True Shooting has fallen to 53 percent, a below-average number. That looks a lot more realistic for a player of Fournier’s modest history! And then there’s Jonathon Simmons. Simmons is really fun to watch: he’s got a twitchy off-the-bounce game and the strength and creativity to finish through contact; he’s a tough and versatile defender who can switch across a few positions; and he’s a serviceable shooter. But in his two years in San Antonio he averaged fewer than one and a half three-point attempts per game, and was a 32 percent shooter. During Orlando’s hot start, Simmons was knocking down 45 percent of his threes, on a modest 2.5 attempts per game; since November 2, his attempts per game have slid a tad, and his accuracy has plummeted to just over 30 percent. He’s another player whose contributions in the early going probably just weren’t sustainable. He’s still fun to watch! But in order to have a top-five offense in the modern NBA, you need some really efficient offensive players, and if you were thinking Gordon, Fournier, and Simmons were going to be those guys, you were certainly fooling yourself. And, no, D.J. Augustin is not suddenly Good. What I’m saying, here, is Orlando’s offensive rating is not likely to settle in the upper half of the league. They are very likely to finish with both an offense and a defense that rank in the bottom half of the league, if not the bottom ten. There are reasons to be optimistic about the future: Gordon is still a talented guy, and even if his production never really comes close to what it was to start this season, there’s a good chance this year really will show incremental improvement; Isaac, a rookie, has a lot of fun potential. And Orlando, being Orlando, will likely add another high lottery pick to the mix after this regular season! 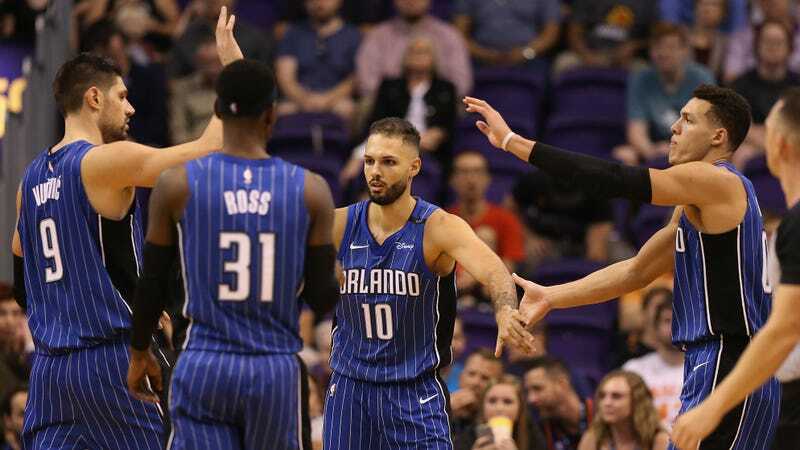 The Magic have some decent strengths, and their fans have some reason for honest-to-God optimism, even if, for the umpteenth year in a row, that optimism should be for a future that will arrive sometime after the end of this NBA season. For now, they’re still the Magic. They took a little longer to remind us of this fact than usual this season, but we got there eventually.